Born on college campuses, Pong Toss is the ultimate party-game favorite. Now Pong Toss Pro! Frat Party Games takes it to the next level by featuring a completely redesigned throwing system for complete accuracy and improved graphics. Also new to Pong Toss Pro is Tournament Mode. You can have a 4, 8, or 16 team bracket play in Pong Toss & Speed Pong. 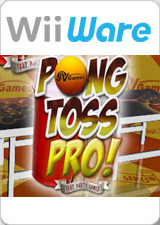 Pong Toss Pro features six regulation tables and the ability to modify simple house rules. Rock it with a high energy rock soundtrack; listen to the announcer commenting on your play. Rule the table with Fireball bonuses for consecutive shots. In Speed Pong, up to three challengers can compete at the same time. Speed and strategy are the keys to this fast-paced game. Jack up your opponents by using a slew of power-ups that will slow them down. The first one who sinks the last cup wins it all! The graph below charts the compatibility with Pong Toss Pro - Frat Party Games since Dolphin's 2.0 release, listing revisions only where a compatibility change occurred.